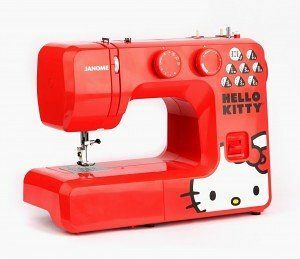 Janome Hello Kitty Sewing Machine Reviews – Super Cute! What’s the best way to get a young seamstress to sew? Make sewing fun and easy for him or her to do. Intimidating, unfriendly machines will collect dust in your closet. I’m happy to say that this collection of Janome Hello Kitty sewing machines takes a new, fun spin on sewing. I’m also happy to say that these are fully functioning and quality built sewing machines that are definitely not toys. 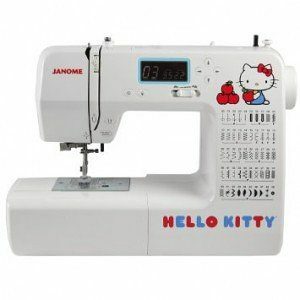 Now, any Hello Kitty fan can enjoy sewing with a cute, fully-featured sewing machine. Janome, the company, was first founded in 1921 under the name Pine Sewing Machine factory. It wasn’t until 1954 that the company would change its name to Janome. Based in Japan, the company is the first to offer a computerized sewing machine for home use, and also the first company to offer a long-arm quilting machine. The company continues to innovate today with the latest trend being the Hello Kitty line of machines. You’ll find basic models that are small and compact to computerized featuring a Hello Kitty theme. Children and adults can use these sewing machines for everything from quilting (with the computerized model) to making shirts, pants and various other items. Anyone from beginners to more advanced users will find lots to love too. 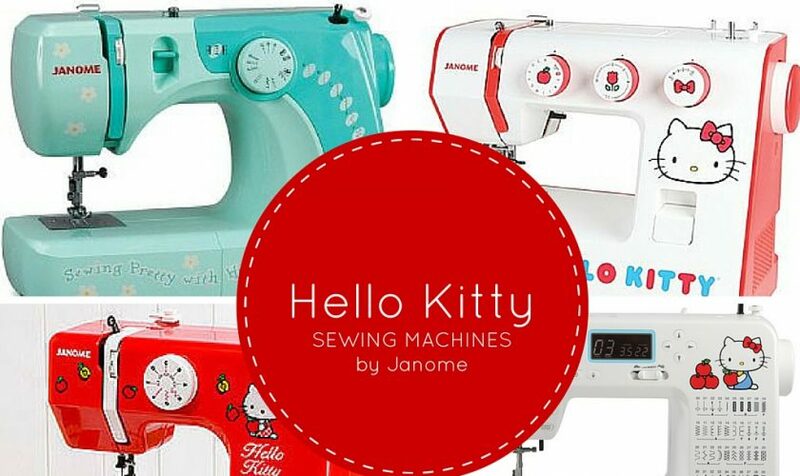 We’ve rounded up the top 4 Hello Kitty sewing machines offered by Janome for you. You’ll also find that a lot of the extras needed, such as a carrying case or seam ripper, are included. Users also have the option to adjust width length (up to 4mm) and width (5mm). A usable free arm further adds to the machine’s ease of use and advanced sewing capability. This machine weighs just 10 pounds, so it’s light enough to carry around and great for kids or busy moms. While these machines may be in a kid’s theme, they are perfect for users of all ages and skill levels. Meant for beginners, many users, myself included, have used this model for advanced sewing projects without an issue. And for the low price, this machine is ideal for every user. => Click here for pricing and availability for the Janome 11706 on Amazon. Users will also receive a folding carry handle for easy transport. 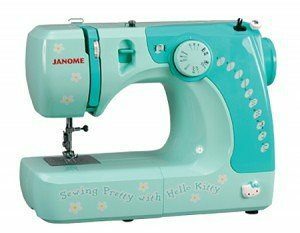 This model makes sewing fun, and even includes advanced stitches and tension control for heavy-duty fabrics. A reverse lever is available, so you can perform the perfect lock stitch for your garment. Snap-on pressor feet allow for easy setup, and changing stitches is done with a dial. Don’t worry, a visual diagram of all stitches is present. A great machine for all ages, the only issue with this model is that it’s a little heavy for younger users (most full-sized models are). This model weighs 14 pounds, so if your child is under 8 years of age, you’ll be better off choosing the 11706, which is a little lighter and smaller or you can take a look at the other kids sewing machines we recommend here. Note: Most full-sized models are 14 or more pounds in weight. If anyone over the age of 8 is using this machine, it’s perfect. You have easy buttonhole options, several stitches and even a reverse lever to create a lock stitch. It’s perfect for all skill levels and ages. => Click here to buy the Janome 13512 on Amazon. Sewing in tight spaces is a breeze thanks to the free arm design, while the 22 stitches offer a variety of sewing options. The bobbin features a front vertical design, while presser feet snap right on with no screwing needed. If you’re sewing through thicker fabric, you can adjust the thread tension with ease. You’ll use a dial design to choose between stitches, and there is a reverse level to create a lock stick. An adorable design features the Hello Kitty logo on the right side of the machine. A grown-up machine that’s perfect for kids and adults alike, the 15822 is one of the best Hello Kitty models on the market. => Click here for pricing and availability for the Janome 15822 on Amazon. You’ll also receive a slew of accessories with your purchase. This model is all about speed and ease of use. Users will be able to choose stitch length, sewing speed, stitch width and even tension control when sewing. A one-hand needle threader and a jam-proof bobbin are also nice advanced functions to have. The on and off button allows for added safety, while the reverse button allows for lock stitches to be sewn quickly and easily. This is the machine that’s perfect for the frequent sewer, or the advanced sewer that is all about speed rather than manual sewing. There are no monogram or alphabet options with this model, and it’s not a computerized model that is ideal for quilting. With that said, is one of the most affordable computerized sewing machines on the market. If you’re an advanced sewer that wants more functionality than a manual machine but doesn’t want to pay the extra cost for all of the quilting options, the 18750 is perfect for you. And, of course this model features your favorite kitty :). => Click here to buy the Janome 18750 today. 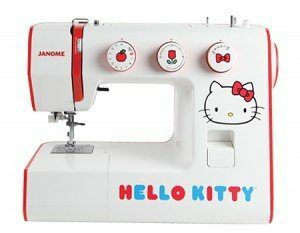 These are the perfect sewing machines for any fan of Hello Kitty. Affordable and fully functional, all of these machines can be used to make real garments and are definitely not toy sewing machines. With the quality of Janome, these models will last for years and come with the famous Janome warranty. Model 13512. This is an amazing little machine. I have sewn on Berninas and Pfaffs for fifty plus years. I purchased this Hello Kitty machine to get my granddaughters into sewing. Perfect machine for young beginners and would be excellent for adults as well. This machine has beautiful, evenly balanced stitches, runs quietly and smoothly and is easy to use. I am pleasantly surprised at the quality of this little gem.